The Delta Acoustic Screens are our deluxe range of Acoustic office screens. 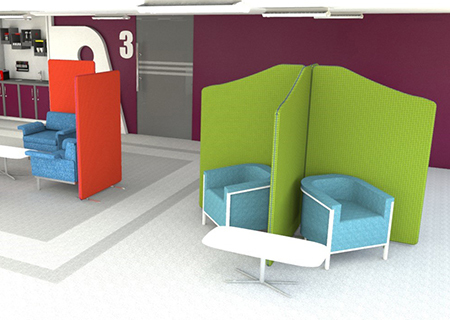 These build on the core integrated with our office partitions by enhancing the acoustic design and introducing the vibrant Universe fabric, which can help to enhance and liven up any office space. We manufacture the Delta office screens in a four different designs, thereby ensuring they are able to adapt to any open environment. Delta acoustic office screens are unique compared to traditional office screens and it is not just the exterior which is different. At the core of the screen, we introduce acoustic foam which helps to absorb sound waves in order to improve conditions in noisy open environments. This kind of design traditionally features in theatres and auditoriums to prevent reverberation and when packaged into office screens, it can help to provide a similar effect. Each product is made to order, which means they can be customised to adapt to your space. 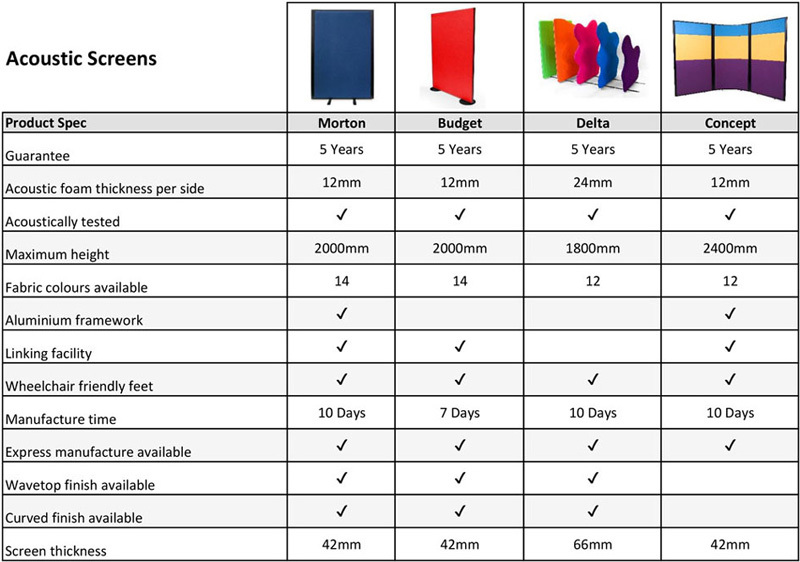 Personalisation options include the style of partition screen, fabric colour and the size of the panel. As is standard with all of the Delta free-standing office screens that we manufacture, there is a five-year manufacturer's guarantee included. The Delta acoustic office screens focus on introducing a partition which will help to address some of the biggest concerns associated with open environments. We manufacture each element using high quality materials in order to ensure the Delta office screens are as effective as possible as soon as they arrive. Inside each screen there are two thick layers of acoustic foam which help to absorb ambient office noise. To create a partition which is tailored to the needs of our clients means that we manufacture them ourselves at our premises in Peterborough, Cambridgeshire. From here we take care of the order from the first call to it leaving our doors. As we perform thorough checks throughout the manufacturing process, we include a five-year manufacturer's guarantee with all of the partition screens that we produce. With both straight and curved designs available, the Delta acoustic screens can be arranged into a range of unique shapes in order to adapt to the open space. Each product page includes further information and guides on how our free-standing acoustic screens work. For additional assistance, you can call our team of advisors on 01733 394941 or send an e-mail to [email protected].